through a CompuWeigh SmartChoice module at Dakota Plains Ag Center near Parkston, SD. Photos by Ed Zdrojewski. A little over a decade ago, when Dakota Plains Ag Center LLC built its rail terminal, the joint venture’s planners were savvy enough to locate the facility more than five miles from the nearest town of Parkston, SD. Being outside of town means there are no long harvest time truck lines blocking access to in-town homes and businesses. All of that is under the control of SmartTruck automated truck weighing system purchased from CompuWeigh Corp., Cheshire, CT (203-262-9400), and installed in 2011 as part of a larger storage and handling expansion project (see page 28). SmartTruck manages traffic through a combination of long-range RFID tags, outside message boards, electronic photo eyes, video surveillance camera, outdoor ticket printers, and a powerful computer system customized to the elevator’s specific needs, which interfaces to an AGRIS accounting system. 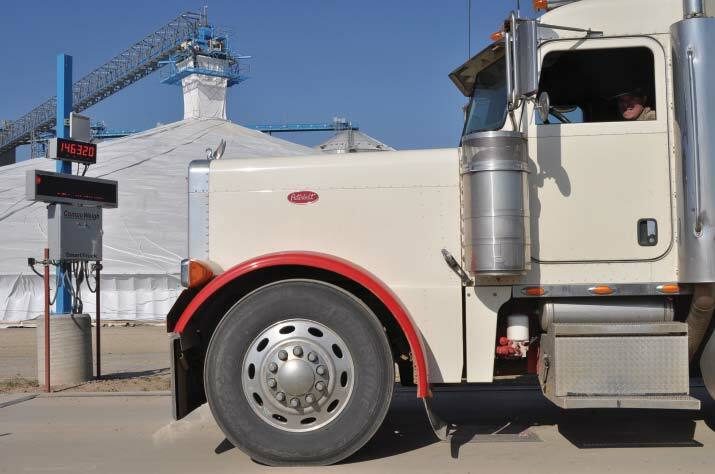 Dakota Plains is far from the first grain operation to make use of SmartTruck for traffic control, but Murtha comments that this system has some unique, custom-designed features that make SmartTruck the logical choice for automation of the grain receiving process. At most facilities where SmartTruck is in place, permanent RFID cards are issued to each truck. The card then is tied to the truck and provides information elevator personnel can utilize to track the progress of the vehicle and load through the property. Dakota Plains came up with a different way of handling this. Instead of issuing permanent RF cards to drivers, the company placed containers full of temporary RF cards at the entrance drive. This allows transient trucks, which may never or seldom return to Dakota Plains to be issued an RF tag. Driver picks up a scale ticket from a SmartCard printer adjacent to the outbound scale prior to departing the Dakota Plains facility. These tags then are collected prior to the truck leaving the facility through the use of SmartCard RF collector positioned next to the OTP-4600 outdoor ticket printer. Drivers are required to insert their temporary RF tag into the SmartCard collector prior to be printed a scale ticket. From there, drivers proceed to the inbound scale, which is equipped with dual CR Manufacturing, Inc. truck probes. Using two probes for sampling saves about 20 seconds per truck, Murtha notes, which can add up on a busy harvest day. 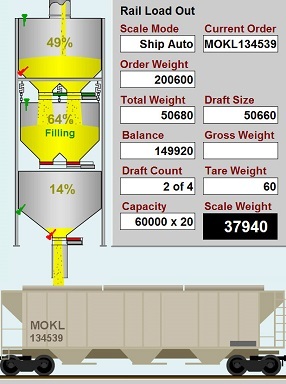 After the grain sample is tested, CompuWeigh’s SmartChoice module assigns a receiving pit automatically based on current pit rules, which can be adjusted or overridden throughout the day. A SmartView message board at the scale directs the driver to the correct pit. As the truck pulls forward and heads to the pits, a SmartLane dump pit traffic control module tracks trucks to make sure they remain in the correct lane. Utilizing the SmartPit dump pit verfication module, if a truck drifts out of the correct lane or heads to the wrong pit, an alarm sounds and a Dakota Plains employee directs the driver back to the correct lane. This eliminates the chance of bin contamination. If an excessive number of trucks causes a backup at any one pit, SmartPit and SmartLane work together to ensure the traffic flow remains consistent and, more importantly, accurate. 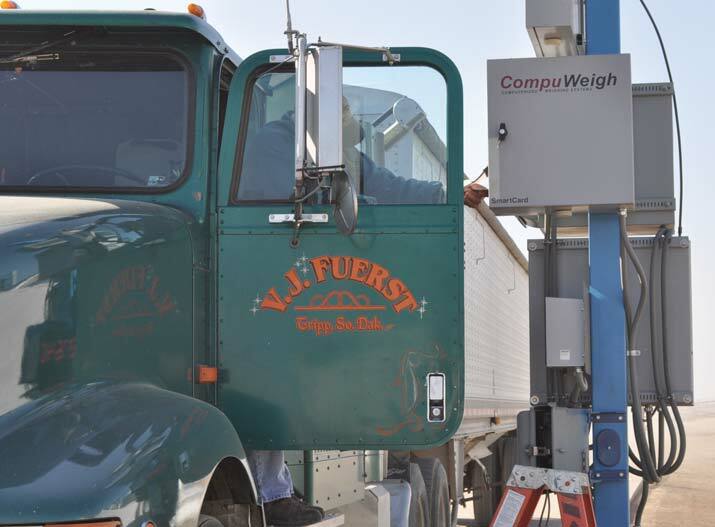 Once the driver unloads grain, the truck proceeds to a new Fairbanks Type S 120-foot pit-type outbound scale, where the driver receives a scale ticket from the OTP-4600 outdoor ticket printer.